Junior League of Lafayette began in 1957 as Service League of Lafayette. The seventeen women who organized the Service League were Mrs. Bella Nickerson Abramson, Mrs. Emalie Comegys, Jr., Mrs. Margaret Ramsey Copeland, Mrs. Azalie Crain, Mrs. Geraldine Fontenot, Mrs. Malise Foster, Mrs. Jean Frazell, Mrs. Martha Green, Mrs. Frances Wallace, Mrs. Barbara Hartwell, Mrs. Irene Hetherwick, Mrs. Susie Hughes, Mrs. Janelle Morgan, Mrs. Woodthrow Meeker, Mrs. Lucille Copeland, Mrs. Mary Ann Sadler and Mrs. Martha Smith. Three Honorary Members were Mrs. W. W. Hawkins, Mrs. Donald Labbe, and Mrs. Bennett Voorhies. This group formed the charter membership. In 1974, the Service League of Lafayette was admitted into the Association of Junior Leagues, and officially became Junior League of Lafayette. 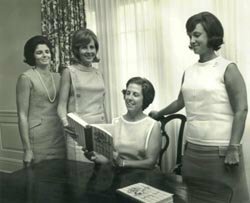 Since 1957, Junior League of Lafayette has continued the vision of Mary Harriman, founder of Association of Junior Leagues International, Inc., through its ongoing efforts to affect positive change in the community of Lafayette. Over these 60 years, Junior League of Lafayette has provided trained volunteers for community service in areas of local need including child health/development, education, health/well-being, social services, substance abuse prevention, teens/juvenile justice, voluntarism and the arts. Through the tireless fundraising efforts of our members and the tremendous community support over the years, JLL has raised over $6.5 million dollars to fund and support our Mission. Whether through the hands-on work of our volunteers, or by funding League-sponsored community projects, or by making direct grants to nonprofit organizations whose interests and priorities are consistent with our Mission statement, the rich history and tradition of service of Junior League of Lafayette continues to grow!